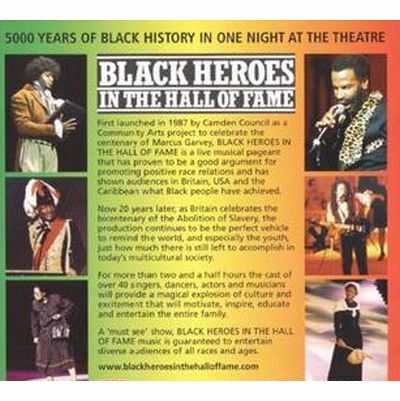 On March 6th, the internationally acclaimed stage musical, Black Heroes in the Hall of Fame, returned to the Hackney Empire. This spectacular production, is a moving and dramatic tribute to over 5,000 years of Black history, and highlights the contributions and achievements made by great Black men and women towards creating world peace, prosperity and freedom – as well as acknowledging their accomplishments in the world of science, sports and entertainment. With an all new line-up of characters, songs and dances, the show magically recreates significant moments in Black history by bringing to life some of the most important figures of times past including; The Kings and Queens of Africa, The Freedom Fighters, The Great Achievers, The Great Entertainers as well as Malcolm X, Martin Luther King, Marcus Garvey and Nelson Mandela – all of who feature in the Great Debate. Described as cross between a traveling Black history museum and a ‘live version’ of Madame Tussauds – because where else would you see heroes such as Rosa Parks, Cleopatra, Harriet Tubman, Angela Davis, Paul Robeson and Muhammad Ali sharing a stage? – Black Heroes in the Hall of Fame is an explosion of information and cultural expression, designed to motivate, inspire, enlighten, educate and entertain diverse audiences of all races and ages. The production – created by Flip Fraser in collaboration with JD Douglas (lyrics) and Khareem Jamal (music) – was first launched as a community project in 1987 at the Shaw Theatre in Camden. The show broke box-office records, and made history when it opened at the Astoria Theatre two years later, by becoming the first all Black production to play in the west end. Sell out tours throughout the UK, Caribbean and USA followed, as did awards and honours such as; the prestigious Spirit of Detroit Award, Key to the City of Miami Award and a Proclamation Declaration from the Mayor of Washington DC establishing 5th February as “Black Heroes Day” for the city. In the mid nineties, during a tour of the states specifically aimed at schools and colleges – the cast and production team played an integral role in the Mayor of Chicago’s ‘Stop Black on Clock Killings’ campaign, when they participated in a number of community workshops and national events set up to tackle youth violence. So successful was their involvement in this crusade, that for the first time since the show’s conception, Flip Fraser and his team – who believe young people can be given hope if they are exposed to positive role models – have introduced four weekday school matinees to the forthcoming nationwide tour. Black Heroes in the Hall of Fame is as relevant and culturally enriching in 2007, as it was when it was conceived twenty years ago. In addition to teaching Black history facts to a wider audience, the show’s core objective remains to expose a positive self-image of black people and their achievements. Flip Fraser says, "When we first launched Black Heroes in the Hall of Fame, we saw it as a great way to promote positive race relations and to highlight to audiences of all races what Black people had achieved. Twenty years later, we still believe it is the perfect vehicle to remind us – and especially our youth – just how much more we have left to accomplish…"
The Gleaner: "The spectacle that unfolded was something to behold." Chicago Sun Times: "Black History has never been presented with this type of magnitude."